It is citrus season. Here in northwest Montana, citrus is expensive and obviously travels a very long distance. We don’t buy much, honestly. I am blessed with a blogging friend from Texas who mails me a box of homegrown citrus every year. 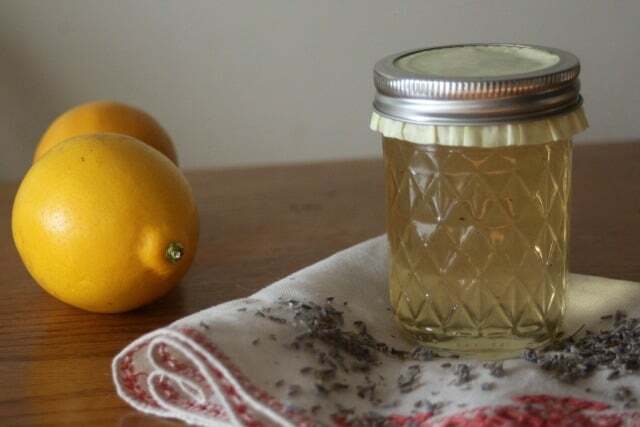 This year, I combined her homegrown citrus with some of my homegrown herbs for this amazing meyer lemon lavender jelly. The clearness of the final jelly belies the flavor within, it is anything but bland. 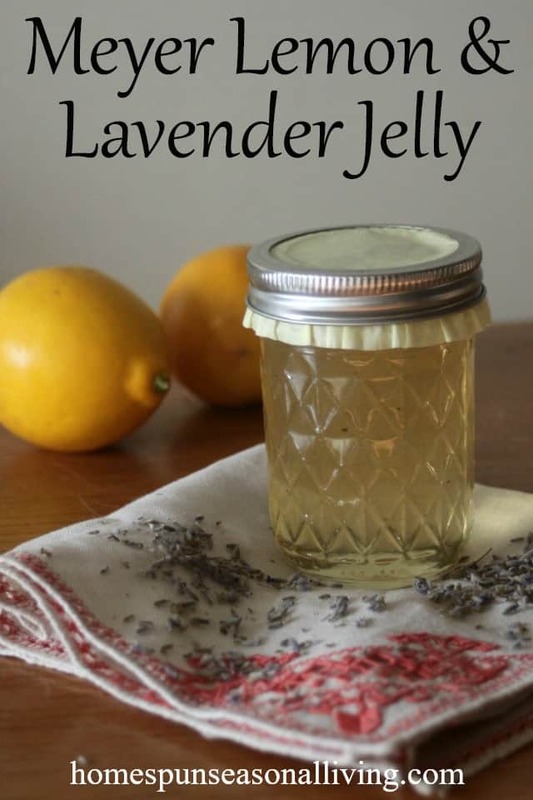 This jelly is very sweet but the sugar does not mask the flavors of the lemons or the lavender. The flavors come through with a pleasant intensity that is perfect on toast, scones, biscuits, or heck slathered on some lavender bundt cake. These beautiful jars start with tea essentially. Don’t rush the steeping process. Let it stand for the full 30 minutes before proceeding. When straining, resist the temptation to press or squeeze the tea from the lavender and peel. This is difficult for me too, but squeezing will likely cloud the jelly. Cloudy jelly is not the end of the world but is not the goal either. 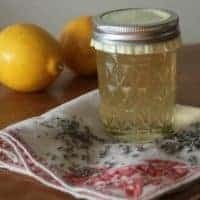 Preserve seasonal citrus with a bright floral flavor in this easy to make and delicious meyer lemon lavender jelly that makes for amazing gifts. In a heatproof bowl, combine the boiling water, lemon zest, lemon juice, and lavender flowers. Cover the bowl with a plate and let steep 30 minutes. While the tea is steeping, get jars, lids, and boiling water bath canner ready. Strain the lemon lavender tea through a fine mesh sieve. In a heavy pot, combine the juice mixture with the sugar. Bring this mixture to a full rolling boil over high heat. Stir in the pectin, return to a full boil that can’t be stirred down. Boil for 1 minute. Remove from heat. Skim off foam. Ladle the jelly into prepared jars. Leave 1/4″ headspace. Wipe rims, place lids, secure bands. Process in boiling water canner for 5 minutes (adjust/increase for elevation). Remove from canner, let cool before removing rings and storing.